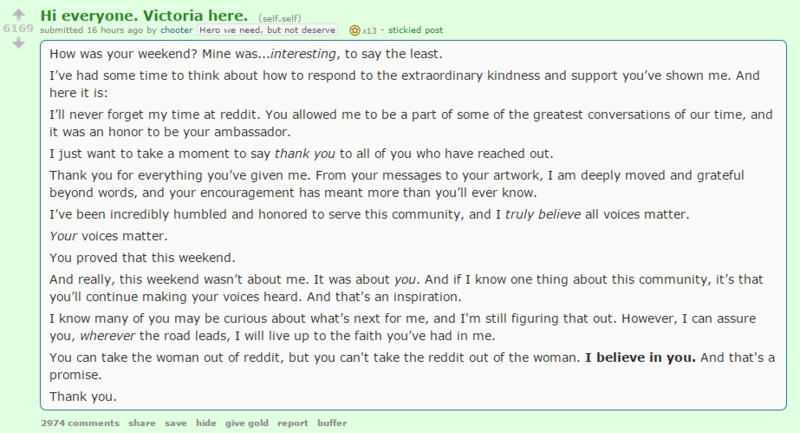 Dismissed Reddit Figure Victoria Taylor Breaks Silence : The Two-Way In a post on the site, r/IAmA's Taylor thanked supporters. Her dismissal this month prompted an insurrection in which moderators shut down many of the site's most popular sections. Victoria Taylor, famous for her role in Reddit's popular r/IAmA section, has broken the silence over her dismissal that prompted an insurrection last week in which moderators shut down many of the site's most popular sections. Posting on Reddit, Taylor thanked those who rallied to her defense, calling the response "extraordinary." "I know many of you may be curious about what's next for me, and I'm still figuring that out," she wrote. "However, I can assure you, wherever the road leads, I will live up to the faith you've had in me." Taylor's note comes just days after Reddit CEO Ellen Pao apologized to users of the popular website, citing a "long history of mistakes" that led to Taylor's dismissal on July 2. Reddit has not publicly said why it let Taylor go, and Taylor's own posting today does little to shed light on what happened. Reddt's r/IAmA (Ask Me Anything) section draws actors, musicians, President Obama and even NPR reporters to answer questions submitted from the vast community. Taylor's role, as NPR's Steve Mullis reported last week, "was often organizer, mediator and even transcriber for many of the AMAs."